The picture is titled “Victoria & Albert Terrace, Hove” and shows the Neptune Inn and other buildings, looking westwards. 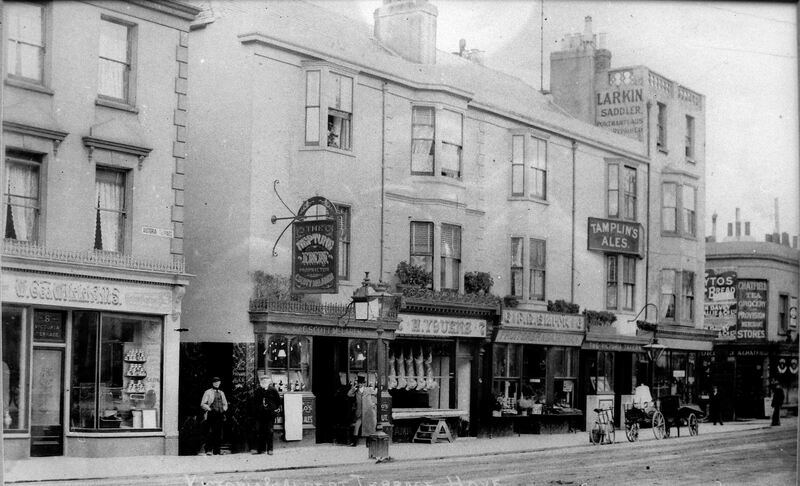 The pub is still there, in Victoria Terrace as it is called now. This photograph is one of two old prints hanging above the bar. I believe it was probably taken between about 1880 and 1900, and the man second from the left is the publican at that time, William Welfare. William was married to my grandfather’s sister, Catherine Martha Ward. She died in 1898, and William died in 1902. Can you help? Do you know of the existence of other copies? My photo was taken through the glass of the framed picture in the pub, in very poor light, so is not very sharp. I would very much like to know more about the photo, and am hoping that there are other better copies out there in family collections, as it looks like the work of a professional photographer, and may have been used on postcards or other souvenirs. Great photo, Neal. My late grandfather’s butcher’s shop at 2 Alma Terrace, subsequently 19 Victoria Terrace, is sadly out of picture to the right. You are right about the Neptune Inn. Its current address is 10 Victoria Terrace. Looking through the census entries, as I expect you have already, it was known as 8 Alma Terrace in 1871, 8 Albert Terrace in 1881, 1891 and 1901, and had become 10 Victoria Terrace by 1911. The changes of names have led to some very strange numbering in the present-day Victoria Terrace! Regards, Alan. Amazing and useful photo, as I’m doing an art project to do with the house my dad used to live in, to the far left, 9 Victoria Terrace – The Cuckoo Clock. It was a guest house when he lived in it. However it has a lot of history to it. Apparently it started as a fisherman’s cottage, then was a fire station with horse stables, then a morgue and then a Sunday School for kids until it was the guest house. Apparently it was also haunted. I have been searching a lot about this house on the internet but I can’t seem to find all of the information I need. If you know anything else or where I could find more information, please let me know as soon as you can. Otherwise thank you so much for this photograph Neal. Sofia, have you worked through street directories for that address? Bearing in mind house numbering can change. The directories are available at both Brighton and Hove libraries and there are large numbers out at The Keep at Falmer. These will give you an indication of the usage of the premises and the rate books will assist as well. I am rather dubious about ‘fisherman’s cottage’ as this parade looks too upmarket!